CIMON (Crew Interactive MObile CompanioN), the AI-based assistant for astronauts for the DLR Space Administration, developed by Airbus in cooperation with IBM, took off last Friday aboard SpaceX‘s Dragon cargo capsule and is scheduled to arrive today (June 2nd). Like many unique robots, the technology demonstrator was built using metal and plastic 3D printing processes. It is the size of a medicine ball and weighs around 5 kg. It will be tested on the ISS by Alexander Gerst during the European Space Agency’s Horizons mission scheduled to last through October 2018. “CIMON will be the first AI-based mission and flight assistance system. We are the first company in Europe to carry a free flyer, a kind of flying brain, to the ISS and to develop artificial intelligence for the crew on board the space station,” said Manfred Jaumann, Head of Microgravity Payloads from Airbus. Pioneering work was also being done in the area of manufacturing, Jaumann continued, with the entire structure of CIMON, which is made up of plastic and metal, created using 3D printing. 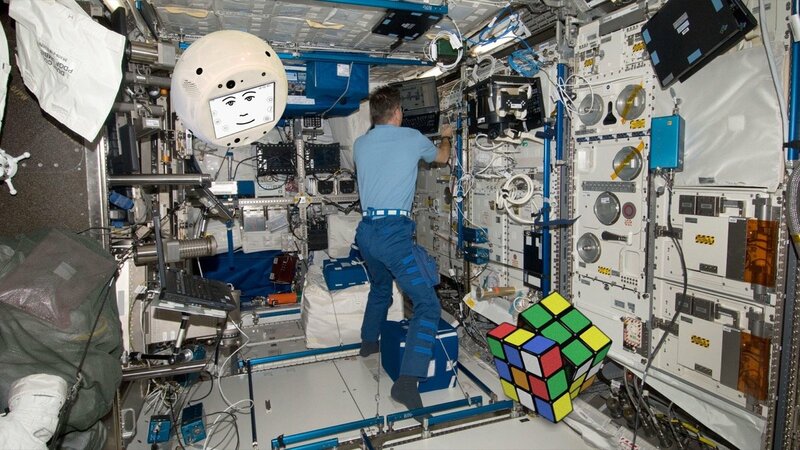 CIMON is designed to support astronauts in performing routine work, for example by displaying procedures or – thanks to its ‘neural’ AI network and its ability to learn – offering solutions to problems. It uses Watson AI technology from the IBM cloud and, with its face, voice and artificial intelligence become a genuine ‘colleague’ on board. With CIMON, crew members can do more than just work through a schematic view of prescribed checklists and procedures; they can also engage with their assistant. In this way, CIMON makes work easier for the astronauts when carrying out everyday routine tasks, helps to increase efficiency, facilitates mission success and improves security, as it can also serve as an early warning system for technical problems. CIMON will get its first ‘taste of space’ as early as March 2018: the 31st DLR parabolic flight campaign will focus in particular on testing and optimizing GNC algorithms (Guidance, Navigation and Control) under zero-G conditions.